I was going to skip this album altogether. Seriously, I was - and I'm not saying that to shock you or be provocative, there's no shortage of records that I'm a lot more interested in covering than Kanye's tangled mess of underwhelming contradictions that'll be excused by diehard fans no matter what is said or done. And when you factor in Kid Cudi... well, I haven't actually ever reviewed a Kid Cudi record in full, but I have heard a fair chunk of his discography and my general impression is a wealth of genre-blending musical ideas and interesting language, but often falling way short in terms of execution, leading to records that can be really intriguing but also extremely frustrating. Ambitious for sure, but the gulf between his best work and his worst is vast, and while his well-publicized mental state might make said projects explainable, it doesn't really make them all that listenable. That said, Kid Cudi and Kanye have managed to find wavelengths where their material has worked before, going back as far as 808s & Heartbreak, and the positive but varied critical reception to this project was intriguing, especially as critics have not held back when it has come to Kid Cudi in the past. And when you pair all of that with a certain overwhelmingly positive review that I don't think anyone saw coming... look, basically for the health of my general operation I had to cover this and put it on my schedule myself, so how is Kids See Ghosts? 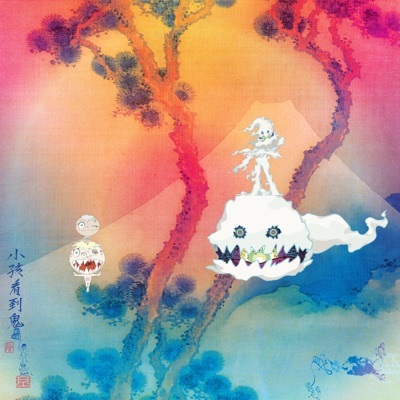 Honestly... it's decent - and believe me, I wish this album inspired more emotions or passion out of me, but while there are some cool ideas within Kids See Ghosts, by the time I got about ten listens in the more I was forced to conclude that it all feels way too scattered and undercooked to come together. And while I absolutely understand why some people are so supportive of this project and was able to resonate for them on a fundamental level, to me it feels underwritten and meandering throughout its short run time, simultaneously dragging in spots but feeling oddly underwhelming as a whole. And the odd thing is that there are flashes where this record gets close to hitting transcendence, and to discuss how and why we need to start Kanye and Kid Cudi. For a nice change of pace, it's Cudi who is the most grounded and restrained on this project, stepping back within his cushion of autotune to keep him on-key for once to provide the foundational hooks and verses for Kanye to catapult off of, at least before Kanye eases back on some of his wildness to fall towards the sort of restrained honesty where he can try to take stock of what he's left in his wake. And the guest artists definitely help in this regard: Pusha-T's verse on 'Feel The Love' might not be his best in terms of wordplay and flow but it does provide an anchor point before Kanye starts spraying what I can only describe as trap scatting, and while I found Mos Def's bridge on the title track to be underwhelming, he was a solid presence on the hook for most of the track. What caught me off-guard was Ty Dolla $ign on 'Freeee (Ghost Town Pt.2)', mostly because his raspy contributions to the choral harmonies were a very welcome contrast to Kanye imitating 070 Shake's overblown delivery on the first 'Ghost Town' - yes, I know the contrast is intentional, but you're not going to convince me that inflection sounds anything close to good and not goofy as hell. But to be fair here, there are some moments in the production and arrangements that caught me off-guard in a really good way - hell, I'd make the argument that of the Kanye-produced projects released thus far, this one probably feels the most eclectic and it starts really strong. Say what you will about the trap scatting on 'Feel The Love', it's got the visceral presence to kick into that sharper march cadence that earns that brief flicker of guitars and flutes before the final hook, and 'Fire' might be even better with its noisy, jangling guitar groove and jingling percussion that in a strange way almost reminded me of an offkilter Swans groove circa-To Be Kind, and I mean that as a high compliment! Couple it with the odd cackles and the hints of flutes and spacey effects and you have a pretty damn potent instrumental... which doesn't quite keep the same momentum against the flipped Louis Prima sample on '4th Dimension', but it does feel reminiscent of 'Jesus Walks', and that's only a good sign. Go a step further to the muted keys and lo-fit beat on 'Reborn' and I actually appreciate the extended, dusty mantra of Kid Cudi's weary voice projecting a way forward... even though that path remains very much unclear. Even on the title track I can appreciate the deeper swells of eerie keys beneath the odd fizzy rumble of the beat, or how Kanye flipped the jangling Nirvana sample on 'Cudi Montage' against the gentle swells of synth beneath the hook from Mr. Hudson and Kid Cudi. And I'll freely admit it requires real skill as a producer to include all of these tones of different fidelities and create a cohesive sound and tone, a textured blur of autotune, rattling guitars, fuzzy samples, bassy rumbles, aching synths, and cracking percussion... even if by the time we reach the final three songs the momentum starts to drip away and the atmosphere starts to show its seams. Granted, I think the biggest reason for that comes in the content, where again I'm going to establish that I consider both Kid Cudi and Kanye to be rational actors in control of their decisions - and hell, that's not part of my critical framing, it's one of the major thematic undercurrents of the album, a hard-fought battle with internal demons that leaves both men free to confront the much bigger issues that might lie ahead of them. And like with ye there is a natural progression on this project, from the bleak, hellish stomping of the earlier songs to the more wistful, ethereal hopes characterized by later tracks that might not be fully free of the darkness but at least can see heaven and hope. And there are definitely details I appreciate with this - I like how Pusha-T's nihilism and Kanye's rage have to be set aside for the reclamation of the self, scars left behind and paranoid debauchery either embraced or transcended, with '4th Dimension' filled with multiple callbacks to Yeezus and the systemically-enforced downward spiral of that project, characterized by the loaded gifts delivered by the Santa Claus stand-in on the sample. But by knowing oneself and embracing those flaws, there is a feeling of exultant release and freedom, and I really do like how on 'Reborn' both Cudi and Kanye speak as frankly and plainly about their internal struggles as they ever have, with Kanye highlighting the sharp juxtaposition of bipolar disorder with lines like 'what an awesome thing, engulfed in shame'... but he's finally comfortable to feel all of it and not be dulled by over-reliance on medication. And Cudi cuts even deeper, as he sees the choices and responsibility he has to take to move away from depression, and I like the next step isn't clear, almost a little uncertain on how he should feel going forward. And then we have the final two songs, where things start to slip. The title track less so - more an assertion of stability and feeling reoriented on the right track, acknowledging those who were prophesying their downfall but confident in their artistic progression to ascend past that - although Kanye doesn't help himself by juxtaposing how he doesn't read next to the Bible he keeps by his bedside, which might be more revealing than intended. But what gets frustrating is the final track 'Cudi Montage', mostly because it's on the cusp of really working - both men having walked a hard road to stability for themselves... only to step into a world overburdened under broken systems, where to them God's salvation might be the only thing to keep them from backsliding if nothing can really change. It's a note of ambiguity against the rising tide of hope... and then Kanye through telling his story of systemic violence ends his verse with 'hopefully Alice Johnson will inspire men'. And again, I get what Kanye's intending with this line - Alice Johnson being the woman who had her sentence of cocaine trafficking commuted by the current president on the request of Kim Kardashian, that her freedom from an unjust drug war could inspire men to change the system... but there are two problems with this. The first is intrinsic to the album itself - the record pushes a very strong individualist narrative of internal growth and spiritual reconciliation, so to place faith in systems to provide hope and change doesn't really fit with that narrative all that well. But the larger issue is that, well, the current administration has no interest in ending the drug war or the prison industrial complex by any of their actions, and this commutation feels like less of a policy change and more of a president infatuated with reality show fame giving a favour to another famous person so that he can continue to use and exploit Kanye's popularity in the black community. And that real world subtext can't help but really colour a message of higher hope that probably won't ring out for many others behind bars right now - not sure that savior is coming, no matter how much Kanye might want him. So look, I wanted to like this album - hell, I do like this album a fair bit, it's at least a step above ye in terms of coherent messaging and tone, even if it starts to break apart on the back half. The production is really solid, there's a stronger core in terms of thematic progression, and Kanye and Kid Cudi deliver good performances... for the most part. But by the back half even if it's intentional it starts to feel scattered and less cohesive than it should, and ultimately feels like less than the sum of its parts, at least for me. As such, I'm giving this an extremely strong 6/10 and a recommendation - not perfect or amazing, but if Kanye wanted to wrench things back on track after ye felt like a misshapen mess, this is a step in the right direction - check it out.